This is the burger you probably made in your teenage years (or yesterday…) but all dressed up. I know I always liked to throw some Doritos on top of my sandwich when mom wasn’t looking. With chips on top of the burger there’s no need for a side because all you need is between the buns–get it? This is the simplest burger and quick to make with just 5 main ingredients. I won’t lie to you, its a messy beast to eat but I’m not too proud to get my hands dirty for a great tasting burger like this one. Just make sure to bring the napkins. And maybe some watermelon. Heat grill to medium-high. Form the ground beef into 4 even patties, ¾ in thick patties. Indent the tops of the burgers with your thumb so they will cook without becoming too round (this way they don’t over plump and it helps keep your toppings on). Season the patties with sea salt and black pepper. Cook 4-5 minutes on each side. A thermometer inserted into the center of the burger should read 155 for medium. Towards the end of grilling the meat, throw on the buns center down to toast. 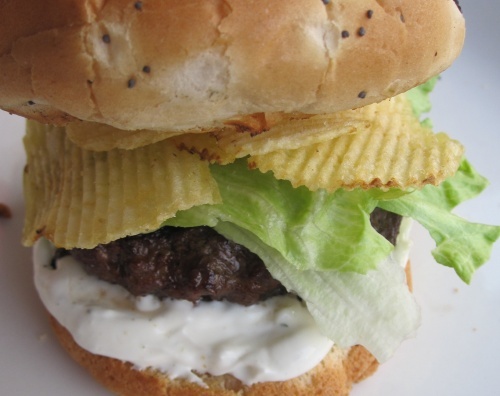 Spread the bottom of the bun with 1/2 cup chip dip (or to your liking). Place patty on top of that, then lettuce, a layer of potato chips, and the top bun. *optional: pickle slices are an added suggested topping. Previous Previous post: holy cow! Next Next post: ‘C’ is for cupcake?